A passenger is suing British Airways after being sat next to 'a 23-stone man' on a 12 hour flight. The businessman claims his back was injured after having to sit next to the overweight individual. 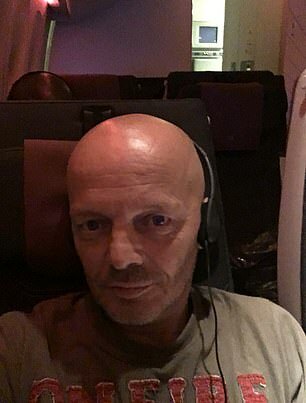 Stephen Prosser, 51, who works as a company director, claims he suffered "soft tissue damage" after the man "wedged" himself into the seat next to him. Mr Prosser, who is only 5ft 2in, claims that the obese passenger was "so large" that his body fat "spilled" into his seat by several inches. His lawyers say Mr Prosser was "forced to adjust his body and sit in an awkward and uncomfortable position" for the whole 12 hour and 40 minute flight. Mr Prosser says he was left suffering symptoms from his injuries for the following three months - and is now seeking damages. But British Airways deny the claims - stating Mr Prosser "did not not display any signs of injury" when leaving the flight. Dad-of-two Mr Prosser said: "I'd spent Christmas 2015 with some friends in Thailand and was returning home on January 10, 2016. "I'd paid over £1,000 for the flight and usually I fly Thai Airways but because BA had a sale on and were cheaper I went with them. "Just as the plane door was about to close, this 6ft 5in elk, weighing about 23-stone got on-board and sat between myself and another passenger who had the aisle seat. "He was a huge bloke, not just overweight but really big boned as well. He was a real lump. "I felt discomfort as soon as he sat down because I was pinned against the side of the cabin. I'm only about 5ft 2in and weigh 10 stone. "I suffered problems with my posture 12-years ago when I used to drive to Kent for work every week so I knew I was in trouble straight away. "As soon as the plane had taken off and we were allowed out of our seats I took the matter up with the flight attendants. "I asked whether they could move him or move me but it was a full flight and they decided not to move me to a crew member's seat because I'd have to keep on getting up to allow them to get to the galley. "They said there wasn't anything they could do so I said I wanted to make a formal complaint which I did with the on-board customer services rep.
"I had no choice but to go back to my seat and the discomfort at being squashed up against the cabin soon turned to agony. "To be honest the big guy looked in pain himself as he had his knees wedged into the seat in front so I didn't want to bother him personally. "I think it's up to the staff to take control of a situation like that and they should have asked the passenger on the aisle seat to swap with the larger man in the middle. "But they didn't and I ended up doing a lot of damage to my back over the course of a nightmare 13-hours." Mr Prosser says he continued to see a chiropractor up until May this year. Defence documents to the claim show Mr Prosser was sitting in a window seat on the plane and the "obese" passenger was in the middle seat. Mr Prosser told the manager he would have "back pain" and would not be able to go to work if he wasn't moved. But the manager found the comments "surprising" after it was less than half an hour after take-off. The manager said the passenger next to Mr Prosser was "well built and over six feet tall, but certainly not fat." British Airways say the passenger "did not have fat which was spilling over the arm rest." Mr Prosser, of Tonypandy, South Wales, was offered extra pillows and blankets to support his back - which he accepted. Before the hearing, a spokeswoman for BA said: "As the case is subject to ongoing proceedings, it would be inappropriate for us to comment."